Want to take static promotional advertising to the next level? Our digital signage floor stands are powerful marketing tools that can revitalize sales and boost brand recognition. 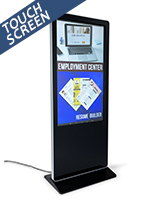 These electronic sign displays combine DisplayIt!Xpress Content Management Software and plug-n-play technology in a sleek, high-tech kiosk sized 43" to 55" high. Stream branded content for an exhibition right from your office chair. The user-friendly Android operating system is easy to install on your computer. Stream high impacty video and multimedia content to the screen using Wi-Fi. These digital signage floor stands are viewed in portrait orientation. Each non-touch LCD screen offers sharp image clarity with LED backlighting. Create videos and slideshows using a USB port or a personal Dropbox account. Our large format electronic sign displays are perfect for advertising in movie theaters, airports, sports arenas, and malls. The faceplate is constructed of tempered glass for durability in high traffic areas. Dynamic moving images and video are proven to attract more attention than static printed advertisements because dynamic moving images are just more interesting! Our digital sigange floor stands combine both platforms for the biggest promotional punch. What are the perks of buying our electronic sign displays? 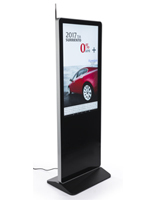 Digital signage floor stands feature wireless connectivity. Kiosk comes with 178° viewing angle for different audience sizes. Feature announcements and news, stream RSS feeds from your PC. Vivid HD 1080p resolution, 450 cd/m² brightness, 1100:1 contrast ratio. 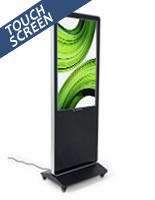 Digital poster stands have a simple interface for scheduling presentation duration. Dual 10W speakers for enticing passersby with audio messages. Electronic displays come with a customizable clock, calendar, and weather widgets. Get lifetime support with a permanent operator license for DisplayIt!Xpress. This lets users wirelessly add content, schedule campaigns and feature live feeds. How can I use an interactive display for connecting with customers? 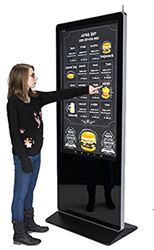 Our advertising touchscreen kiosks are ideal for creating a digital menu or catalog that anyone can interact with. 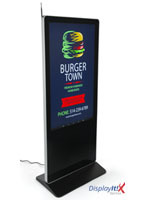 Each electronic advertising stand uses a familiar Android operating system that's easy to set up. These touchscreen displays are as easy to use as smartphones. 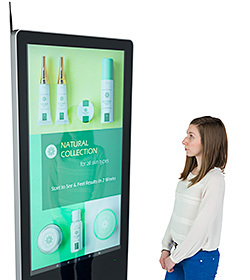 Just like our non-touch models, these advertising screen kiosks have USB ports, Wi-Fi, and Bluetooth connectivity for conveniently uploading content. They also detect up to ten points of contact for advanced functions like zooming and rotating. Use any Android app to create a modern display that helps engage customers and your business reach its goals! 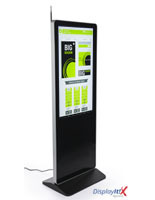 What do our customers say about our electronic marketing floor stands? "Very quick delivery. Good value." "Instructions were simple and easy to follow. Would use the company again." "The displays arrived the next day, were really easy to put together, and are durable and stylish. To top it off, when I called with a question about my order, the customer service was incredibly friendly and helpful." "Fabulous: Order was processed and shipped quickly. Received exactly what we needed. Great quality!" "Knowledgeable technicians eager to assist." Shop MonitorStandsNow for LCD displays with plug-n-play technology for big-scale ads. Enjoy prompt delivery and timely shipping for most in-stock items. Designed to bring more foot traffic into your establishment, generate more sales, and boost brand recognition, our multimedia floor stands are a must-have marketing tool on the cutting edge of sign technology. Once your large-format electronic signage is up and running, be sure to come back and check out other e-posters with content software like the ones we have from SuperSign!